Winter had the feeling that they were competing. If only a little bit, where each desired to outsmart, outwit, or outflirt the other. But OH, Winter nearly PITIED him! No one ever won against HER, and no one ever WOULD. Ten thousand years of age was at her finger tips! No, she didn't care that this man seemed to be able to morph his skin. Change his features, and no doubt was the culprit for the fog that panicked the humans, and made a mad tangled mess of the human cars. Winter gave a grin, hearing his cocky claims, that he claimed were not his own claims, but his birth and from the word of those around him. "Oh? You wish to hear MY claims, stranger?" Winter grinned, eyes flashing. Though, she tensed at the fog rolling in closer, what EXACTLY was she getting herself into? Though, she had no fears of not being able to 'keep up' she had enough devices and technology and skill to keep herself from trouble. She couldn't SEE all that well! The fog was thick, and heavy, still Winter narrowed her eyes lightly, turning around (predicting, of course, that he would stand behind her, as that was precisely what SHE would have done!) and smirking, striding around him. "Boy, I am the very best. And I do not need others, or my blood to tell me such. 'Tis a simple fact of life. Sky is blue, I am the best dancer." Winter cracked a wider grin. "But OH, we ARE getting ahead of ourselves, hmm? What is your name, stranger?" 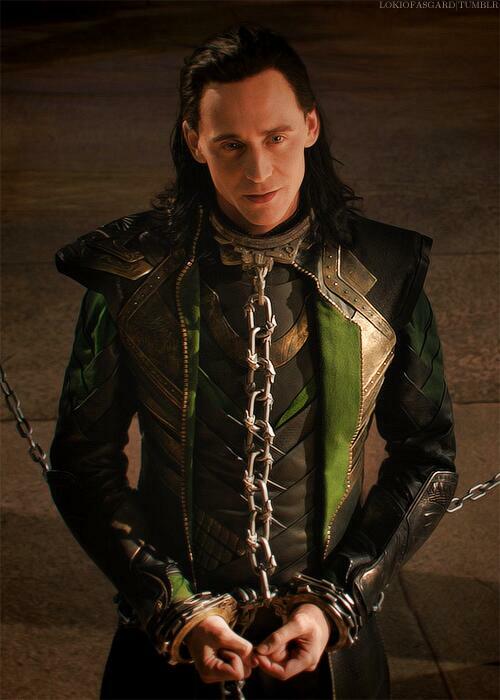 Loki did not think that this woman was a threat. He had never met someone who could defeat him. The Avengers, he told himself, was a ploy to get him back to Asgard. And now he was supposedly a prisoner and that left him close to the king, close to the throne. He cared not for the mortals, only for Asgard. The brilliant thing was that he could always turn his failures into success and believe that was his plan all along. A grin spread over his face as the woman stated her claims and he moved back into the mist, hiding himself. The god had planned to know where things were and managed well in the heavy mist he had created. His plan had fortunately allowed for this. That and the fact that he could make it less heavy around himself. "So it seems you are arrogant enough to make such claims." He said in the mist, allowing it to take his voice in an echo and a muffle. The raven haired god grinned to himself. "When arrogance is so often founded in lies and personal hopes," The god whispered, this time manipulating the mist to amplify his voice. Moving through the mist, Loki smiled, enjoying this dance. "I have many names. I am Loptr, Cunning As, the Hawk's Offspring." He said into the air. Because of the fact that he was meant to be a prisoner, the man had to keep quiet about who he really was. Besides there was no fun in simply giving a name. Bah, it was downright tedious and ANNOYING to not be able to see properly, Winter concluded, Though, she could tell that he backed up a little bit, the way that the mist moved, and whatnot. How ANNOYING. "Loptr, hmm? How.. Original." Winter grinned wide, the very smile laced with smugness. HA! Of COURSE she had gotten it right. Though, she did not intend to play this game of his much longer. He wanted to play? So be it. But it would be by HER rules. Slipping a hand into a pocket, she wrapped her fingers around a perfect sphere, taking it out of her pocket. In her mind's eye, she knew for a fact that it was a spray painted green hue, with a pin on the top, and was about the size of one's fist. In her own eyes? It was onthing more then a simple shape. Winter pulled the pin, dropping it behind her casually, simply throwing it over her shoulder lightly. Winter unhooked a device from her belt, strapping it around her hand and typin in a few keys, her fingers flying over the keys that so intended to stick in the 'on' position and ruin the whole thing. Circuits fizzled, and with one final switch, Winter disappeared. Appearing, of course, on a nearby rooftop, crouching down and smirking at the thick fog below her, eyes on the portion of the street she knew this 'loptr' would be. The device Winter had left burst into thick, curling, widespread, invasive white smoke, adding to the fog, and with any luck, putting HIM out of his element. Strolling down the rooftop a little ways, Winter chuckled, her voice echoing lightly in the distance. "DO try to keep up, dear!" The game that they were playing took a turn for the physical. Up to this moment, the two had been using words and Loki had been having his fun with the myriad of illusions that he could do... well, actually transforming his body and summoning mist but that wasn't too physical. Well, the body might be but he wasn't using that against her. Only to hide himself. So it couldn't be said to be too physical. But she just had to chuck smoke into the mixture. It was invasive and attacked the lungs with it's heavy smell and clogged up the view. Eyes glared and he removed his transformation and the illusion of fog that was adding to the spell. Things were now cut down to the bare minimum. He hoped she was pleased. The spoil sport! So there he stood, tall and resplendent in his armour and leather coat. Green eyes shone in the mist, the god free to reveal himself in the heavy cover that hung over London. Still, the raven haired man was not one to simply give up due to some gas. He was too powerful! A spell started to dispel the mist and smoke around him. After all, if he could bring mist, he could send it away along with that ghasterdly smoke. Fresh air circled around the man and he suddenly sent everything out, clearing the air slightly. The fog and smoke were less dense but covered a larger area. And now that he had done this, he needed to hide again. The short revelation had been to give him extra energy instead of having to maintain a form. He took the form of a tall, thin man with bright ginger hair and a small beard. The typical idea of what he should look like. Then he heard the voice of the woman in the distance. He smirked and teleported towards the direction of voice. Appearing, he created the illusion of a serpent around him. An added touch. But now he was just showing off. The man bored her, and if she was bored, then surely she was going to make a show of it. The building stretched to the sky, the ground below so far in it's hazy gently rolling fog that it seemed miles away from the rooftop. These buildings that so shocked her with how quickly they erupted from the soils upon the ground, was stiff beneath her boots, something that she never changed about herself. Oh, she thought, walking on the rim of the building, it was rifted around the edges for dramatic effect, she supposed,the tallest building in the near area. Lacing her fingers together behind her back, Winter boredly strolled on the thin rim, her light leathered boots slipping into the edges easily, finding it easy and natural to stride on something so thin, on something so dangerous. Danger, well, that was her thing. Winter smirked to herself, glancing over her shoulder, her white hair moving about in the wind, accenting her confident form and beautiful features with ever watchful eyes. "Snake got your tongue, stranger?" Winter called out playfully, not stopping in her strides in the slightest. What a bore, surely, this man had something else to interest her. Lest she loose interest completely, and take his head for such annoyances as tempting her with something to find amusing, then disappointing her with his oh so common shifts of the face, and tangled words. Truly, words were simply that, words, one could be persuaded to do as another likes through them, but that was all they were ever used for, to promote, prevent, or manipulate one into an action. Thus, an action was by far the simple point of the matter. Clearly, this man didn't know how to dance. Perhaps she was a bit tempted to teach him. Still, she thought to herself with a crooked nod of her head at the thought, it seemed such a trouble, why ever bother?